She Said So is, from left, Kate Browne, Mary Cluskey, Karen Donovan, and Mona Beasley. She Said So taking a break during their GLT interview. 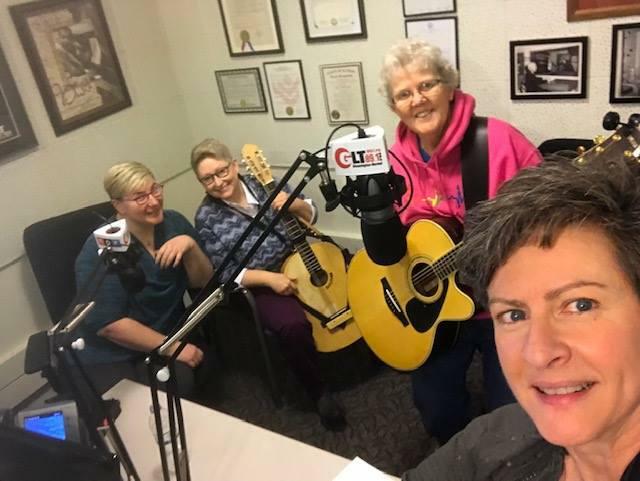 The outfit including guitarist Karen Donovan, bassist Mary Cluskey, and vocalist Kate Browne stopped by the GLT studios with acoustic instruments in hand ahead of their Thursday appearance at Bloomington’s Nightshop. Members said they feel comfortable extending themselves even during practice and rehearsals, and find it’s even helpful when writing original music. This isn’t the first all-female go-round for Donovan, Clusky and Beasley, as they played Bloomington-Normal in the late 90s and early 2000s as Big Sister. The three reunited musically when Beasley and Donovan retired in 2016, then brought vocalist Browne on board to complete the quartet. Though younger than her three bandmates, Browne has many of their musical touchpoints. She also said she is particularly drawn to unconventional female vocalists. “I think that pop-harmony sound is where I started. As I learn more about women in music who are taking a lead role, like Brandi Carlile at the Grammys this year … Brittany Howard of the Alabama Shakes … Neko Case … some of my favorite contemporary vocalists and bringing those back to songs that were not originally performed by women, like 'Wild Nights,' but could be. And maybe the style lends itself to that,” said Browne as the four broke into a rollicking version of the Van Morrison classic. All-female bands, or even bands with equal gender members, is still very rare. The Dixie Chicks come to mind, but even in their native country music, female voices went missing recently on Billboard Magazine’s Top 20 chart. That the gender ratio is still tipped in men’s favor is no surprise to Browne. “It’s the same reasons as it’s always been. You have to always have a young, pretty woman up front or records aren’t going to sell. And there’s a lot of pressure from wonderful pop vocalists like Adele, Kelly Clarkson, and Lady Gaga … just powerful, emotional vocalists who have been told to change their bodies in order to fit into those pop ideas. And men don’t seem to be under those same constraints. They’re not expected to be showpieces out there,” said Browne. Mary Cluskey added the She Said So sisterhood is one aspect of the close relationship among the four, but she said meeting through mutual friends also helps in keeping the drama to a bare minimum. “Like Mona said, we support each other every practice and often have dinner together,” said Cluskey. She said that support extends to how they add songs to their set-list. “What about this one, what about that … ‘Hey Kate, this might be great for your voice, Karen this might be good for you.’ So we’re friends and that’s the bottom line,” said Clusky of how telepathy and empathy plays out in their dynamic. “And we try to make the songs ours. A lot of that is driven by the fact we’re not playing with a full drum kit and very loud electric guitars,” said Beasley, who carries around an instrument much easier to carry around than a drum kit. “It’s called a shuitar,” said Beasley of the instrument she first noticed when the Wood Brothers played the Castle Theatre in 2018. “It’s a guitar made into a drum. You have your lower in the bottom,” she said while patting the bottom of the shuitar. “And then there’s the top part that can be more of a snare. Now I have a tambourine cymbals attached to the top. It does have some strings on it, but I use those for other kinds of different (percussive) sounds. But I attached a “korg clip hit device” that can basically electrify if you will, and put different connections to the bass. In one function it sounds like a high-hat, but it can actually turn this thing into a whole new sounding instrument,” said Beasley. She Said So plays Nightshop in downtown Bloomington on Thursday night. They'll play from 5 to 7 p.m.